Stargazers across much of the world sought a glimpse of a blood-red moon on Friday as the earth's natural satellite moved into the shadow of our planet for the longest lunar eclipse of the 21st century. 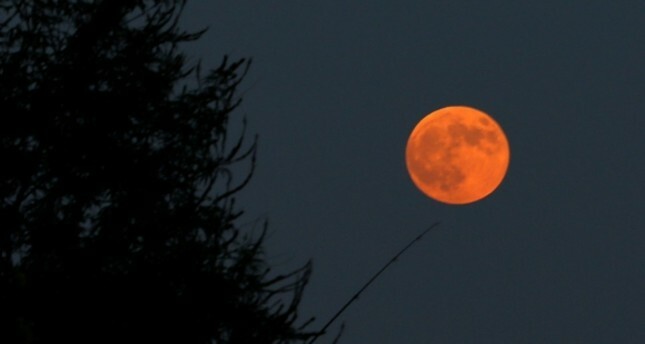 People in Turkey took to the streets and places with a good possibility of lunar observation to have a look at the moon dressed in different hues of red. People living in Antalya, Konya, Istanbul, Van, Adana and many other Turkish cities were also able to observe and photograph the orbit. From the Cape of Good Hope to the Middle East, and from the Kremlin to Sydney Harbour, thousands of people turned their eyes to the stars, hoping to see the moon which began to appear orange, brown or crimson as it moved into the earth's shadow. The fullest eclipse, at 2022 GMT, will be visible from Europe, Russia, Africa, the Middle East, much of Asia and Australia though clouds could block out the moon. In the Middle East, the moon rose above the Sheikh Zayed Grand Mosque in Abu Dhabi while in Kenya it rose over Marabou storks nesting in Nairobi's trees. On the banks of India's Ganges, temples were closed ahead of eclipse. In Singapore, enthusiasts primed telescopes at the Marina South Pier. "Our event is sold out, we have about a couple of hundred people that are booked in to come and watch it with us," said Andrew Jacob, curator at the Sydney Observatory, located right near the Harbour Bridge. When the moon moves into the conical shadow of the earth, it goes from being illuminated by the sun to being dark. Some light, though, will still reach it because it is bent by the earth's atmosphere. At the same time, Mars is be traveling closer to earth than it has been since 2003, so some observers may see what looks like an orange-red star - and is in fact the red planet. "It is a very unusual coincidence to have a total lunar eclipse and Mars at opposition on the same night," said Robert Massey, deputy executive director of the Royal Astronomical Society, who will try to watch the eclipse from the Mediterranean Sea. For thousands of years, man has looked to the heavens for omens of doom, victory, and joy. The Bible contains references to the moon turning blood and some ultra-Orthodox Jews consider lunar eclipses ominous and a cause for moral contemplation. According to Hindu beliefs, celestial bodies like the sun and moon emit negative energy during an eclipse and so some temples in India were closed to minimize any disturbance.